The West Branch of the Penobscot River is noted for its serene and placid nature, offering canoeists one of the best options in Maine for a leisurely and tranquil river canoe trip into the deep north woods. 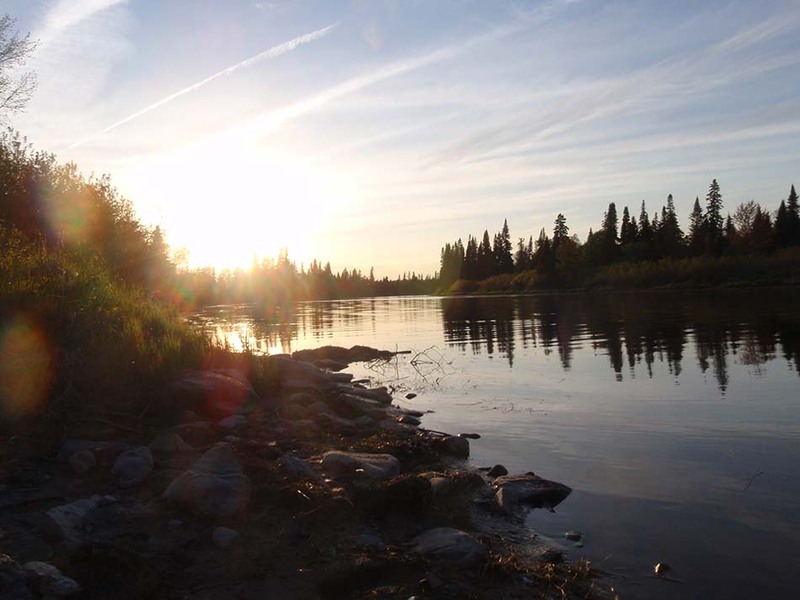 Guests on this river trip are able to enjoy the amenities of rustic, beautiful campsites nestled close to the river’s edge, ample opportunities for swimming, fishing, and stargazing in the clear, undisturbed night’s sky. The West Branch of the Penobscot is an excellent option for groups with younger children or those unfamiliar with river paddling, as there is little whitewater with plenty of miles of meandering current combined with ever changing wilderness scenery, keeps all in anticipation of what is around the next corner. 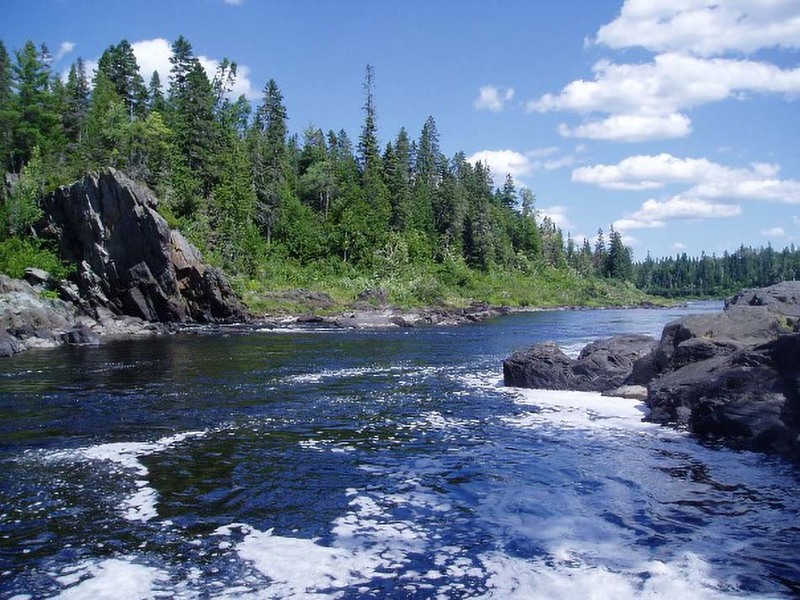 A canoe trip down the West Branch of the Penobscot with Smoking Rivers is an excellent option for those seeking a relaxed and leisurely canoe trip. Featuring excellent opportunities to spot wildlife, fish for trout and salmon, and visit the noted locales of Chesuncook Village and Lobster Lake. 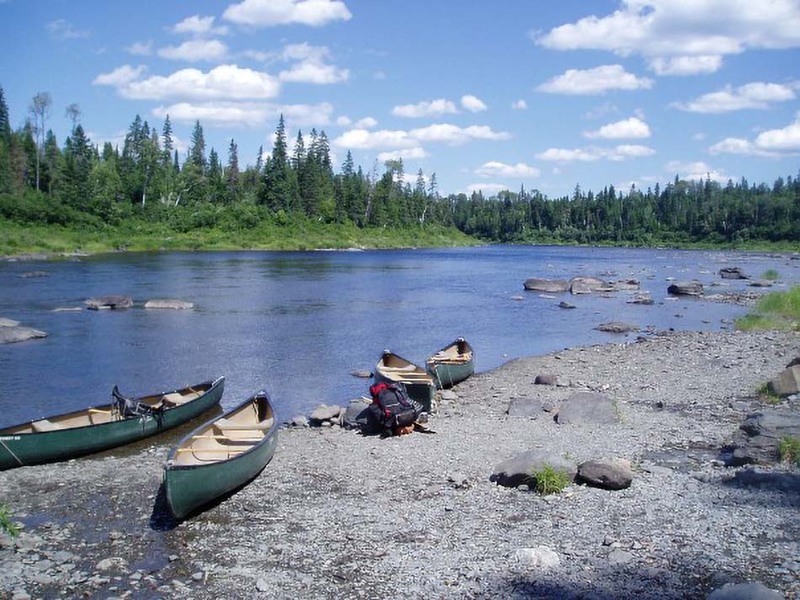 Guided canoe trips with Smoking Rivers are generally organized in 4-6 day fashions, though longer trips are also available if desired. 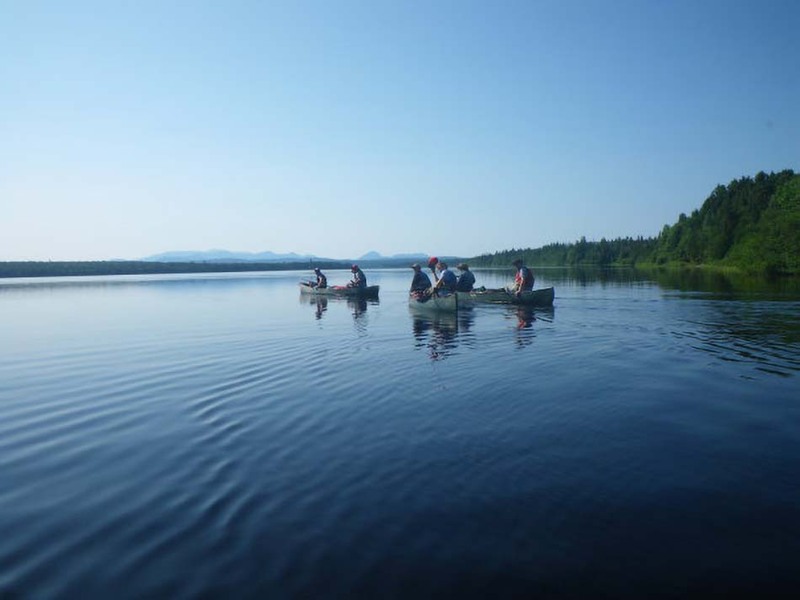 Ideal for groups of all ages and ability levels, Smoking Rivers will be happy to work with your group to select an itinerary on the West Branch of the Penobscot that will meet all of your wishes for a fully guided canoe trip in Maine. Deposit: 30% Deposit required at time of reservation. Remainder due no later than (21) days prior to trip departure (non-refundable). p class=”trip-disclaimer”>Group and Youth rates available. Rates are based off a 4 person trip subject to change depending on group size and duration. From its outlet at Seboomook Lake, the West Branch of the Penobscot begins by traversing a section of difficult whitewater (Class II-III), known as Roll Dam. Essentially a multitude of ledge drops and recovery pools, Smoking Rivers generally excludes this challenging section of river from our multi-day trips. However, if this is a interest of your party, a trip beginning at Roll Dam can easily be arranged to include this white water section. After its tumultuous and headlong run through Roll Dam, the West Branch of the Penobscot then widens and flattens out. 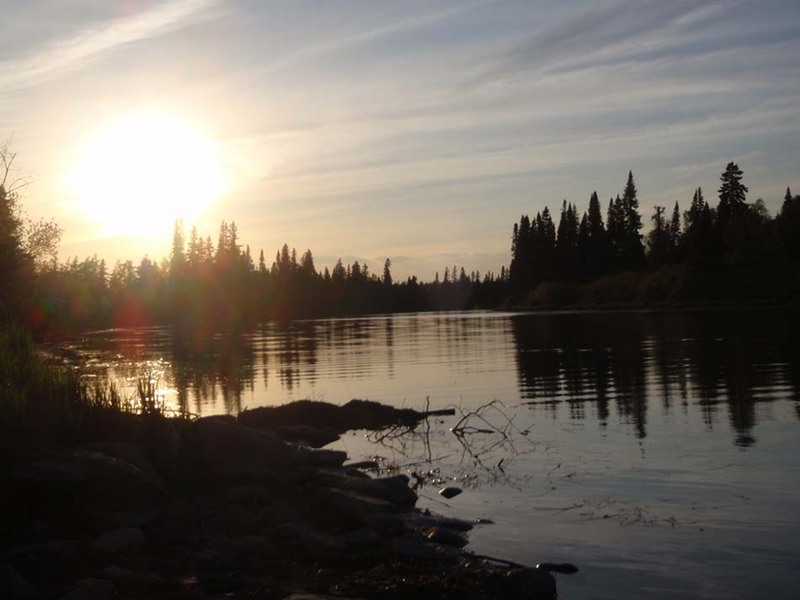 It is marked by numerous miles of calm and some swift water, excellent locales to learn the craft of canoeing, whether solo or tandem, as well as honing the technique of poling, a favorite of many guests on Smoking Rivers guided canoe trips. 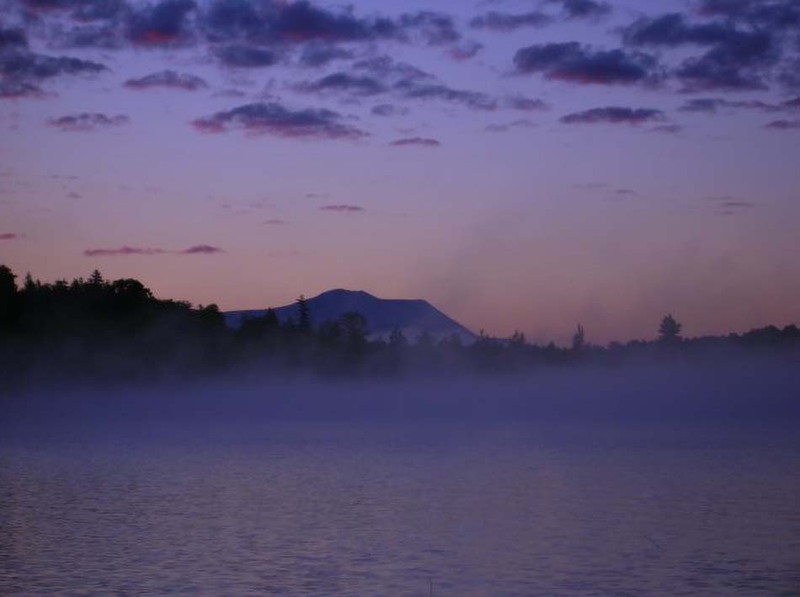 The river features countless sweeping, dramatic bends and the scenery is some of the best available on any river canoe trip in Northern Maine. 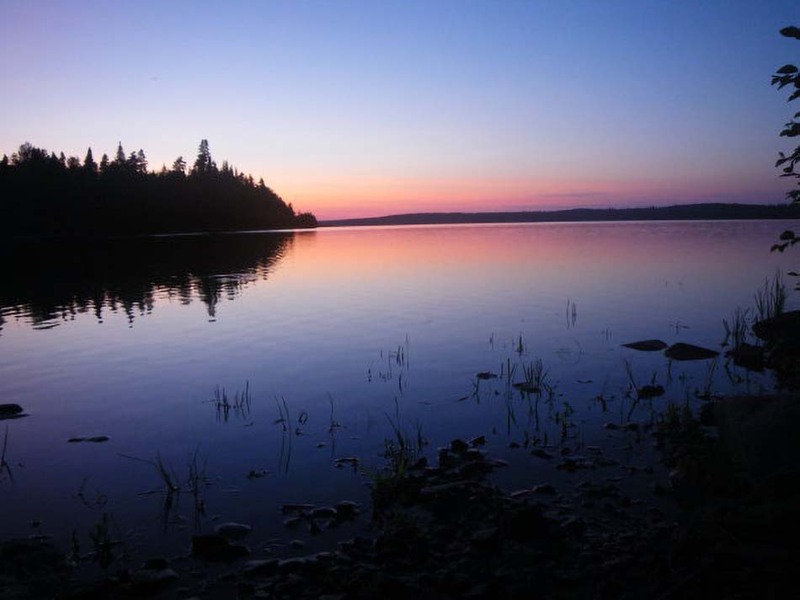 Lobster Lake, regarded as one of the most remote and beautiful stretches of water in the North Maine Woods is always a part of a canoe trip down the West Branch of the Penobscot with Smoking Rivers. A short paddle down (or up, depending on water levels) Lobster Stream, brings paddlers to this untouched lake. Named because of its overall shape resembles that of a lobster claw, when viewed from nearby Lobster Mountain. 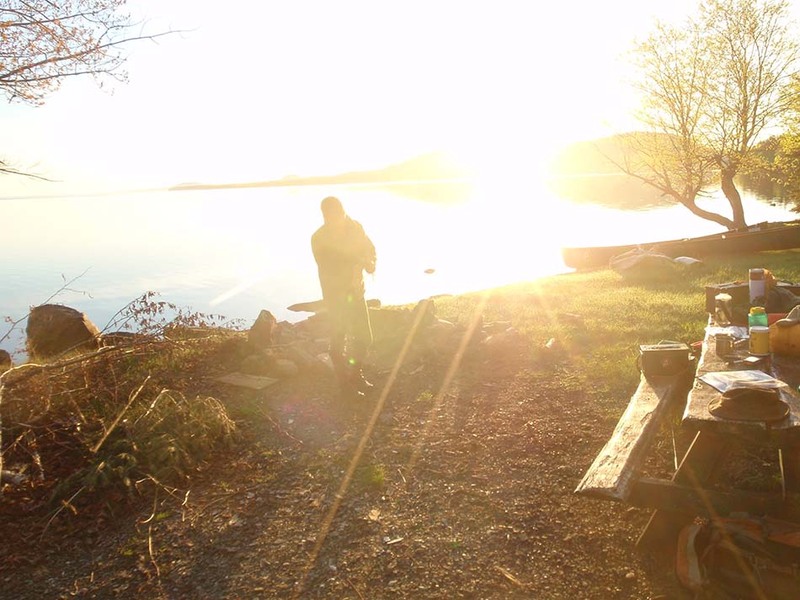 Its shores are marked by numerous scenic campsites, many of which feature sandy beaches that are superb for swimming and fishing, notably for native landlocked salmon and lake trout. 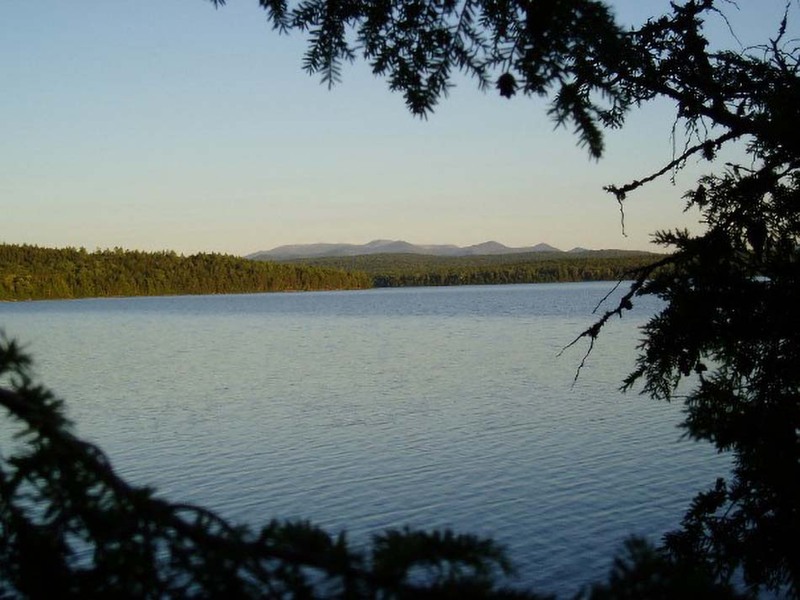 For groups looking for an even more leisurely schedule and to enjoy quiet time at this tranquil location, the option for a layover day here (staying in a campsite for two nights) may be available along with side hikes up Lobster Mountain, on Lobster Lake. Returning to the West Branch of the Penobscot, paddlers are treated to more calm water alternating with some swift water for many miles. Heading downstream, the West Branch of the Penobscot has many great locations that are ideal for spotting Maine’s largest land mammal, the moose. Most active during dawn and dusk, moose will often come to the river during the day to cool off and feed on the aquatic vegetation that is amply found in the river. While not guaranteed, the West Branch of the Penobscot generally features one of the highest percentages of moose sightings on any river canoe trip in the North Maine Woods. While many paddlers look forward to seeing moose, there are many other native species that inhabit the woods and waters canoeists will traverse while on a West Branch of the Penobscot canoe trip with Smoking Rivers. In this area, there are thriving populations of ducks, notably Common Merganser, as well as beaver, deer, otters, and muskrat. Fishing is also quite excellent on the West Branch of the Penobscot. The most common and highly regarded quarry is the Brook Trout, though populations of salmon are known to be quite active and fun to catch, particularly later in the season. 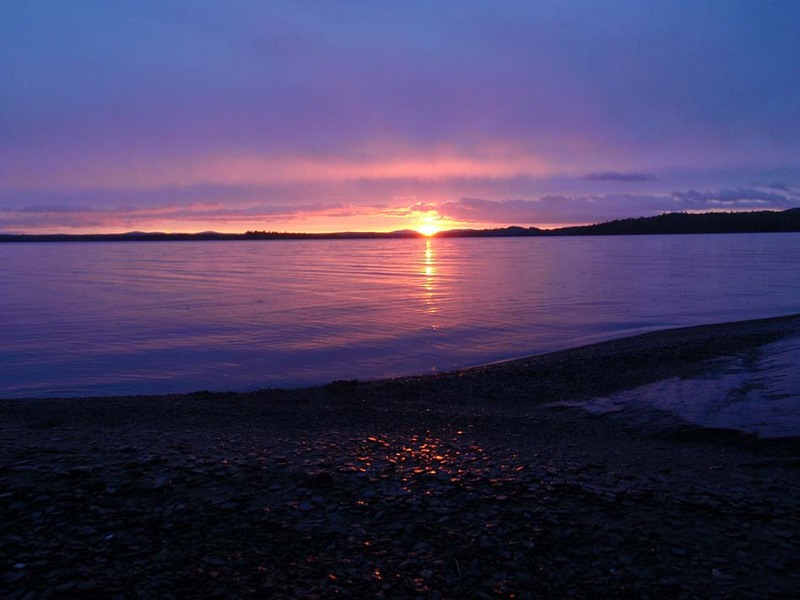 At the trip’s culmination, on Chesuncook Lake, lake trout are the most popular target, however for the more casual angler, white and yellow perch are more commonly caught. As always, Smoking Rivers and its Registered Maine Guides will assist you and your party with tips on tackle, locations, and general pointers to help ensure success if fishing is an interest of your party. 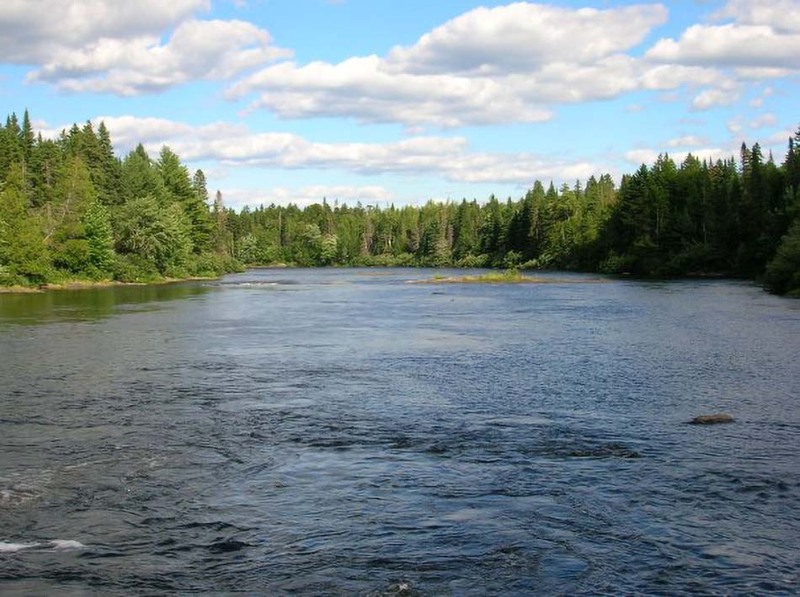 Upon reaching an area of the West Branch of the Penobscot known as Big Island, the river splits into two distinct channels around Big Island. In this location, paddlers will find the only whitewater of significance on the river, known as Big Island Rips. A very easy, Class I rapid, the moving water and underwater pillow rocks will be sure to excite and paddlers will gain a new perspective on the river as they feel the water rushing beneath the canoe. From Big Island, the river soon begins to widen into a marshy, delta-type of waterway as it nears Chesuncook Lake, the 3rd largest body of freshwater in the State of Maine. Chesuncook Lake was formed between 1835 and 1916 by the damming of the West Branch of the Penobscot. 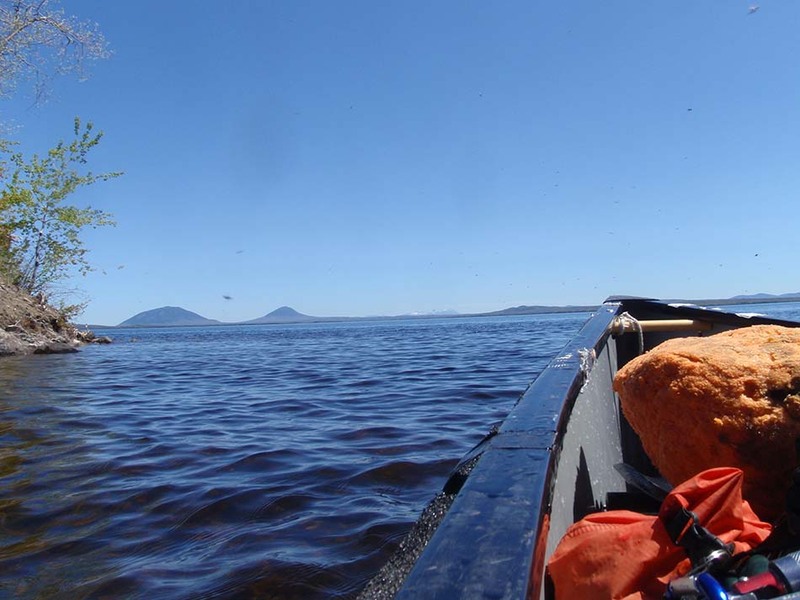 Today, it is a very popular, albeit remote lake, for sportsmen, anglers and canoeists alike. 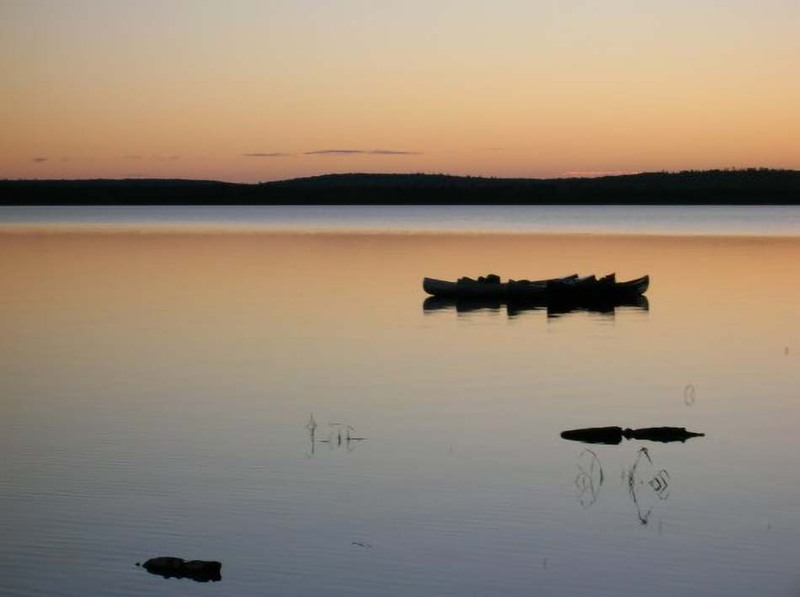 Featuring one of the most unique locations accessible on any canoe trip, the historic Chesuncook Village. Settled originally in 1849, Chesuncook Village remains today a superb example of a 19th century lumbering outpost. Scattered with a few privately owned homes, most of our canoe trips on the West Branch of the Penobscot will opt to visit this remote holdover village of the past. Wandering through the village’s dirt roads, we will encounter picturesque views, a small chapel, schoolhouse and other interesting buildings that harken back to Maine’s lumbering history. Chesuncook Village, nearly inaccessible except by boat or snowmobile, today still hosts a year-round population and residents, proud of the legacy of their town. Upon reaching Chesuncook Lake and visiting Chesuncook Village, the end point for Smoking Rivers West Branch of the Penobscot canoe trip is Chesuncook Dam, some 18 miles further down the lake. 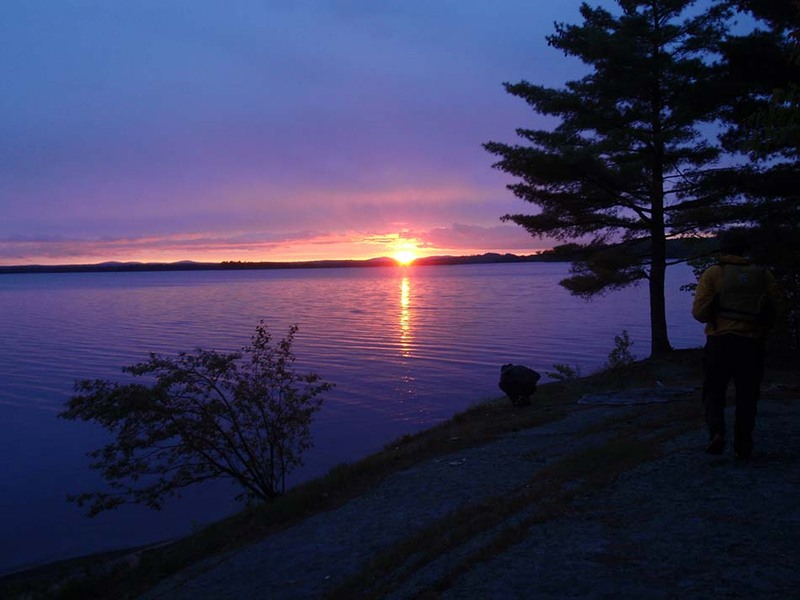 Generally, we schedule extra nights for the paddle down the lake, as winds and waves can sometimes be large on this, Maine’s 3rd largest body of water. 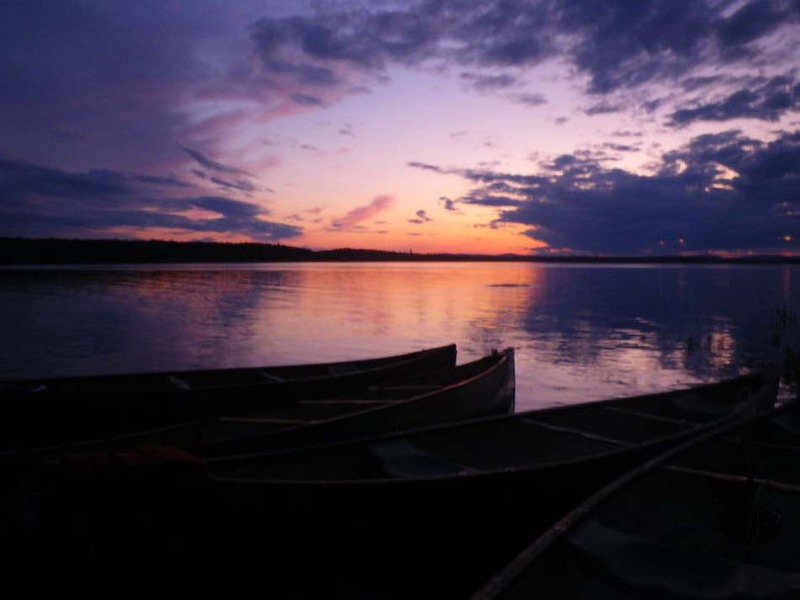 Canoeists are treated to some of our Registered Maine Guide’s favorite campsites in the entire North Maine Woods. Gero Island, a massive wilderness preserve that is large than some entire towns, is our destination for our first night on the lake and its beautiful rocky shores provide an excellent view of the setting sun. Following Gero Island, Mouser Island is generally our final night’s camp and is a tiny, windswept island that makes the paddler feel as if they are truly deep in the North Maine Woods even as the trip nears an end. 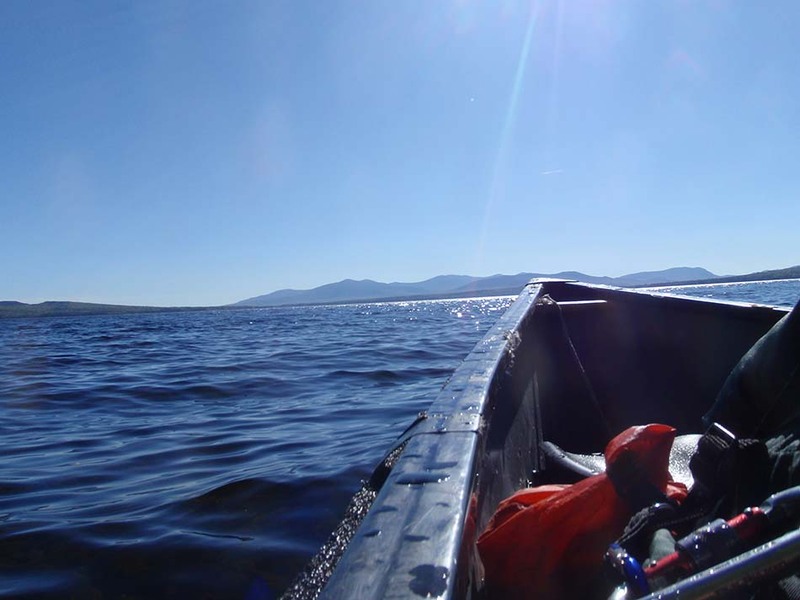 Beyond the beautiful campsites and huge expanse of water that makes up Chesuncook Lake, the entire time we are paddling towards our destination at Chesuncook Dam, we will be treated to a stunning view of Mt. 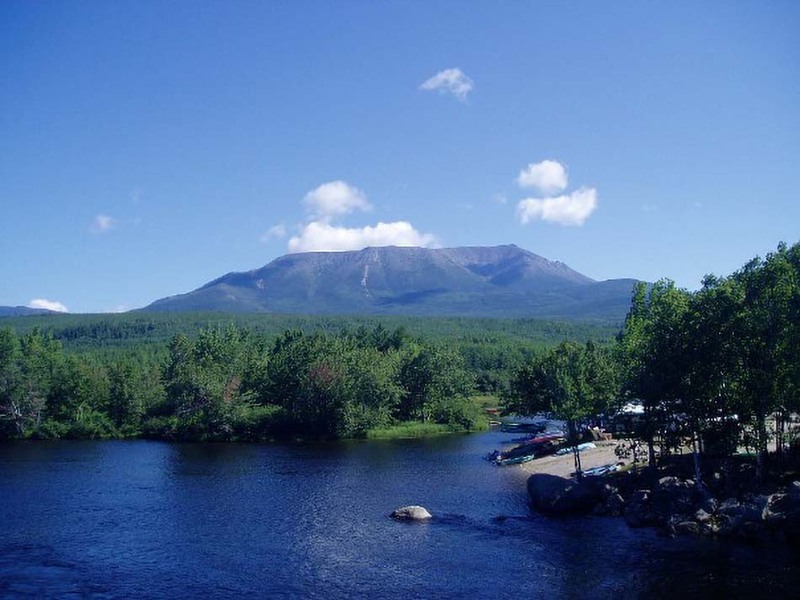 Katahdin, the tallest mountain in Maine, and a view of the back side of this iconic landmark that is seldom seen but by canoeist. Particularly on the final day, opportunities to photograph this majestic mountain are ample and make a great photo, especially during sunrise.